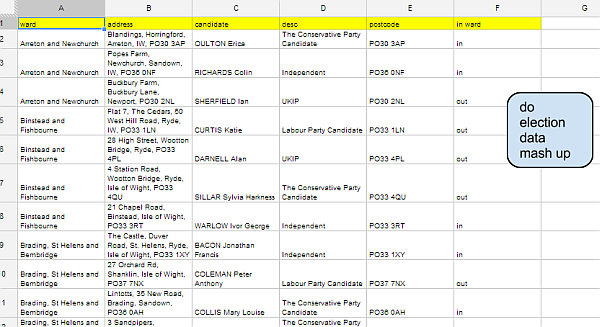 On his oUseful blog, Tony Hirst showed how to use Open refine plus various APIs to research which candidates were standing for election in the wards in which they live. Here's a VBA implementation of the same thing, which you can find in the scraperwiki module of cDataSet.xlsm. Converting to Google Apps Script is pretty simple since I have the components already migrated from VBA. I only have one one function to convert, since everything else is in the mcpher shareable library, and since the functions have been implemented in an abstracted way there is really only a little code/syntax tweaking needed. Here's the result. More on VBA to Google Apps Script?